« TSS: Gearing Up for Audiobook Week! If you were told that you won a book, please look through the list and choose with one you would like, then email jen(at)devourerofbooks.com with your selection. Greyed out books have already been selected by someone else and are no longer available. Please make sure that the book you select is available to be shipped to you. I will do my best to keep up with greying out books as they are selected, but it is possible that the book you choose will have already been chosen and not yet crossed off, so please have a second choice, as this is first come, first served. Ulysses by James Joyce, narrated by John Lee – Us/Canada only, this audio has 24 cds and is heavy! Wow! How exciting! Now everybody, hands off the Simon Vance audio please. That one has my name on it! Not untrue and not unkind!!! please. How nice that you are doing this and international included too!!!! much appreciated. I’m putting my name in the bag for Backseat Saints!! That list is quite impressive, Jen! 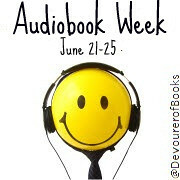 Thank you so much for hosting this audio book week! I had a great time participating and sharing the audio love.